The Harborview is located in the heart of the village with beautiful views of the harbor. 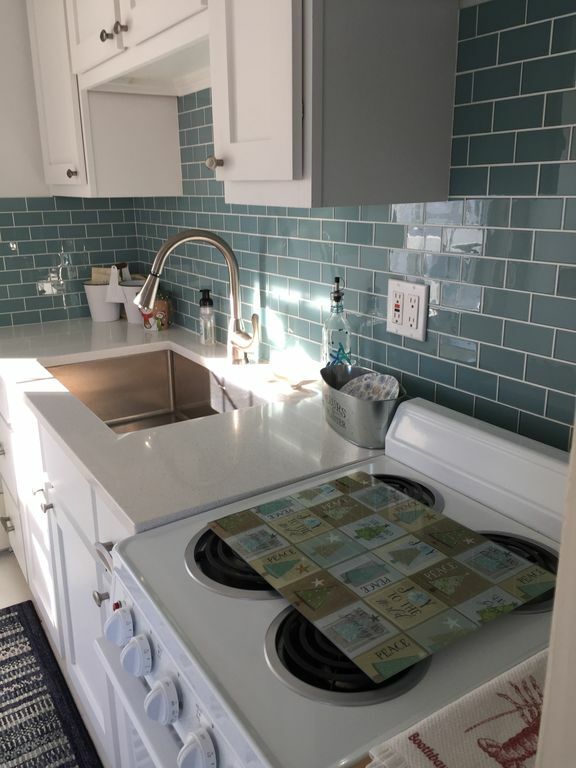 Very Sunny one bedroom Completely re-modeled this year, with white washed maple hardwood flooring and a fully custom built kitchen with beautiful white quartz countertops and sea glass back splash. A Queen size bed in bedroom and a queen sized futon in the living room. Fully equipped kitchen. Full bath with shower & tub. Direct TV, wireless internet, front loader washer/dryer. Linens and towels provided. Parking provided off premise. This is a non-smoking building/unit. Our Beautiful Harbor offers many activities including kayaking, paddle boarding, Whale Watching & Puffin Watching excursions, Harbor tours, trolley rides through both sides of the harbor, the Coastal Maine Botanical Gardens, many preserves for hiking, antiques, and lots and lots of fantastic restaurants and shopping, most just steps out our door!! We also can be found in the Boothbay Harbor Mart & Country Store! Boothbay Harbor Mart & Country Store is centrally located if you need a great cup of organic fresh or cold brewed coffee, a breakfast or lunch snack, a cold beer or bottle of wine, even a cooler to hold it all in! For those who forget or just pack light, we also have toothbrushes, sunscreen, dramamine, and many toiletries and necessities. If the calendar is full for Harborview look at our other HomeAway rental #3722997 our "Starfish" one bedrm or #3673276 three bedrm called Oceanside rental in the same location with views. A celebration of signature Holiday events in Maine midcoast’s quintessential seaside towns of Boothbay and Boothbay Harbor! The towns sparkle with thousands of lights and the shops, restaurants and hotels are all open and ready to help you make wonderful Holiday memories! Check out the Boothbay Festival of Lights signature events as well as all of the other exciting events and happenings around town – and plan your trip today! Owners own and operate The Boothbay Harbor Mart & Country Store. We are here to help make your vacation a pleasant and memorable occasion. We have all the supplies and needs you may have forgotten or simply would like, to complete your stay. The "Golden Triangle" of Boothbay Harbor in Mid-Coast Maine is the most desireable location. It is steps from the heart of the Harbor and it's many shops, restaurants, and activities. Boothbay Harbor has been a summer home to families for generations. The location is convenient to all the village activities. Across the street from the Boothbay Harbor Waterfront Park and Piers of the downtown. Located in the center of Boothbay Harbor Village with a view of the Harbor. Step out the door to the Harbor's best shopping, restaurants and water activities. Views of beautiful Boothbay Harbor. This Harborview unit in Boothbay is so cute! It is located very close to wonderful restaurants and stores. It was so fun to look out over the harbor and quaint buildings. The unit is very clean and stocked with anything you might need for a comfortable stay. It is decorated in a nautical/seascape theme that I just loved. This rental was perfect for us, since we like being in the middle of the “the action.” The building is right in the center of town. The unit itself is a cute, tiny 3rd floor apartment with a small kitchen. It’s appropriate for a couple. The windows look out over Commercial Street, and you can see the water of the harbor inbetween buildings. The owners are usually available, since they run two of the stores on the ground floor of the building. They’re knowledgeable and very helpful. We would definitely book this rental again! Highly recommend. The location and accommodations were perfect. The apartment was well-appointed and comfortable with a view of the town and harbor. The owners, Patty and Mark, were warm and friendly as well as helpful in making recommendations during our stay. We will definitely plan to return to Boothbay and hope the apartment will be available. Charming location and gracious hosts! We had a great time - I can't say enough about the location of the property. It gave us the true feel of a small New England town. Patty and Mark were wonderful and personable hosts. We are so grateful to have our harbor location right in the heart of downtown Boothbay and love sharing it with others!! I'm so glad you were able to spend some time here with us! This was our second stay at this lovely second floor apartment. Clean, well appointed and wonderful views with lots of windows for people watching. It is located right in town so it is close to everything Boothbay Harbor has to offer. Owners Patty and Mark were warm and friendly and the free morning coffee in their market was yummy and very welcome. See you next year!!! I'm thrilled we will get to enjoy your company again in the future!! For over a century the Boothbay Harbor region has been a favorite destination of travelers longing to relax and enjoy the rock bound coast of Maine from land and sea. With it's snug Harbor, long peninsula, and numerous islands, the region is renowned for its natural beauty and boating pleasures. A bustling place, Boothbay Harbor retains all the charm and rich heritage of a maritime New England village – white clapboard homes, numerous specialty shops, galleries, boat yards and marinas dot the Harbor's rocky shoreline. Boothbay Harbor boasts the largest fleet of excursion boats on the coast for viewing lighthouses, seals, islands, whales, puffins, and the spectacular foliage in fall. Deep-sea fishing cruises for cod, mackerel, tuna, haddock, and striped bass leave daily for full and half-day trips. Boothbay Harbor's fine marinas and fishing facilities are well known to yachtsmen cruising the Maine coast. Seafood is the dining specialty – clams, scallops, shrimp and the king of them all LOBSTER. It is also the home of Coastal Maine Botanical Gardens a must-do when visiting the harbor.